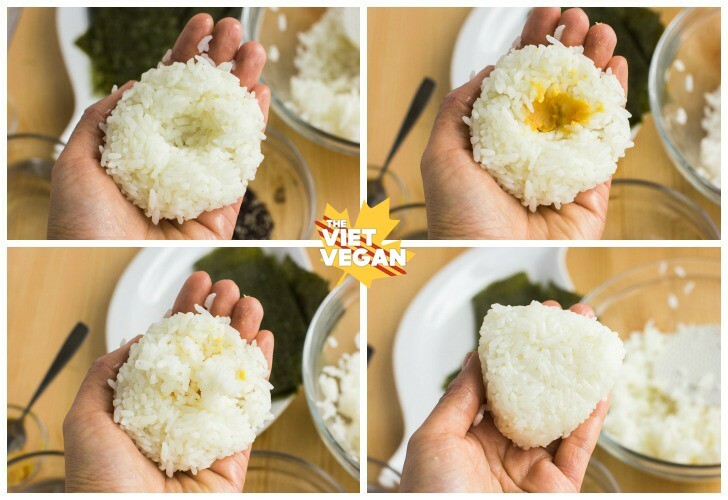 Filled rice triangles that are perfect to-go meals that are fun and easy to make! 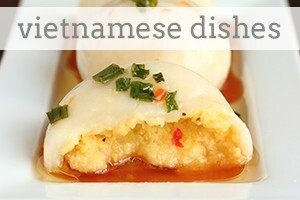 The more and more I spend time alone, the more I tend to fall back on childhood comforts and Vietnamese food. Every now and then I bounce back between missing downtown Toronto and loving the fact that I don’t have to pay for most street parking west of the city. I miss the seemingly infinite options of vegan eateries in Toronto, whereas further west there seem to only be a handful. I find that I spend less time going out (and less money!) and I don’t crave the decadent burgers and vegan mac and cheeses that Toronto is apt to offer. Mornings are filled with cravings for hot noodle soup and afternoons are peppered with Asian fruits like persimmon and pomelo. I’ve swapped out my staple of spinach and dill for bok choy and coriander. It’s also comforting to live across the street from Asian grocery stores, where they don’t think I’m weird for buying a bucket of miso, kimchi, and copious amounts of noodles every week. I’ve been called a banana pretty much all of my life, meaning that I may look Asian, but inside I’m as white as sliced bread. Growing up in a tiny town a few hours north of Toronto, where the population was 15,000 and I was one of three non-white families, I could understand why I’d get the moniker. The more Burrito Boy and I get to know each other, the more I’m discovering who I am as a default, instead of who I am as a person who used to morph herself into the ideal partner. “You’re actually a lot more Asian than I thought you were,” BB said to me one day. As someone who can get sick of various foods within a week or two, Rice and miso are one of those things that I can eat happily every single day. Salty, umami, soft, sweet. Rice and miso are a pair meant to be. 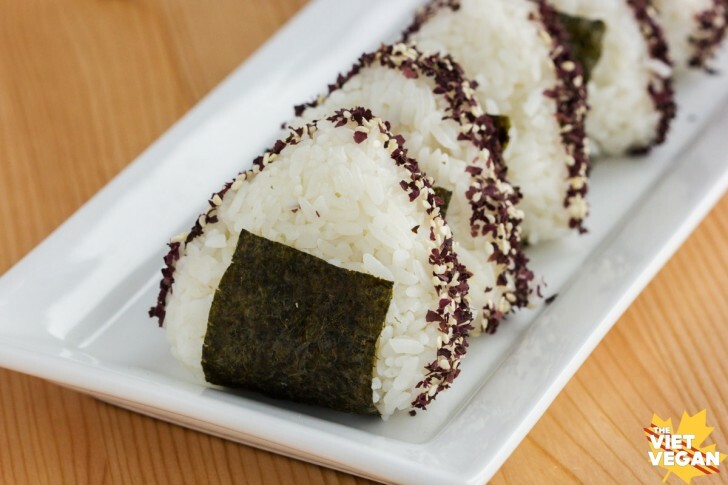 I decided to go super simple with this onigiri, but there are also more traditional fillings, like tuna salad (which I think I’d sub with chickpea salad), umeboshi (pickled plums), or others. 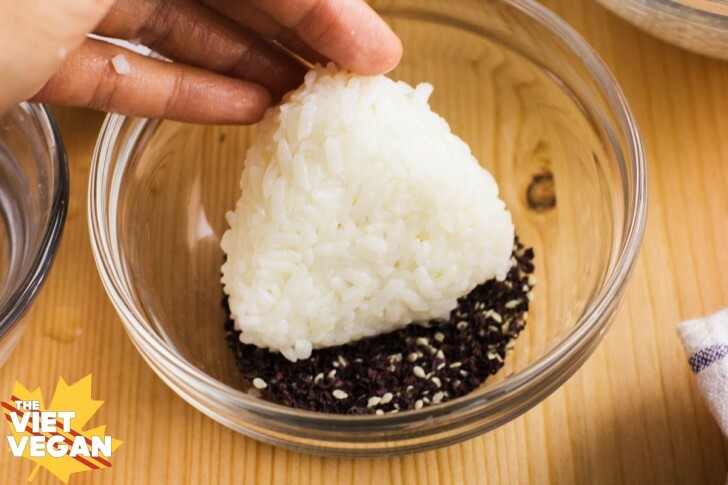 Some onigiri can be made by seasoning and adding the fillings to the rice itself, so it’s like a triangle of stir-fried rice—with carrot, edamame, seaweed, mushroom. 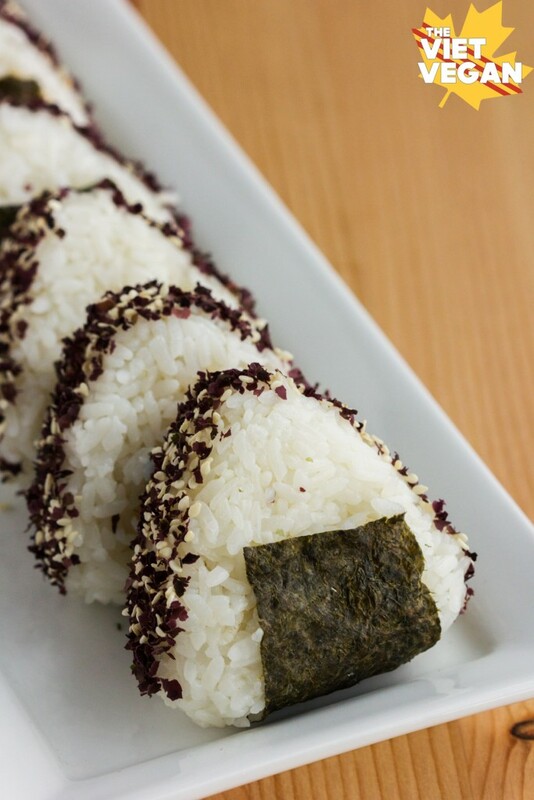 But I really wanted to make something that resembled the onigiri that Brock used to make for Ash and Misty in Pokemon. Feel free to play around with your own fillings. I wanted to coat the outside with some extra flavour and nutrition: dulse flakes are flavourful seaweed flakes that are dense in minerals yet have a pleasant, salty flavour. Some say it tastes like bacon, but I don’t think that’s necessarily the case. Maybe whole dulse when panfried has that crisp, salty texture, but the flakes are more for presentation and flavour. I love that the roasted nori adds both texture and a little handle for you to eat the rice without getting your hands dirty. If you want to keep the nori crispy, add it right before serving, otherwise, add them beforehand for more of a tender, sushi roll-like texture. Have fun, and enjoy! 2 cups short grain sushi rice, washed, drained and cooked in a rice cooker. It's about 1 parts rice to 1.2 parts water, since you want the rice to be a little sticky. Divide the rice into 8 portions and let cool. 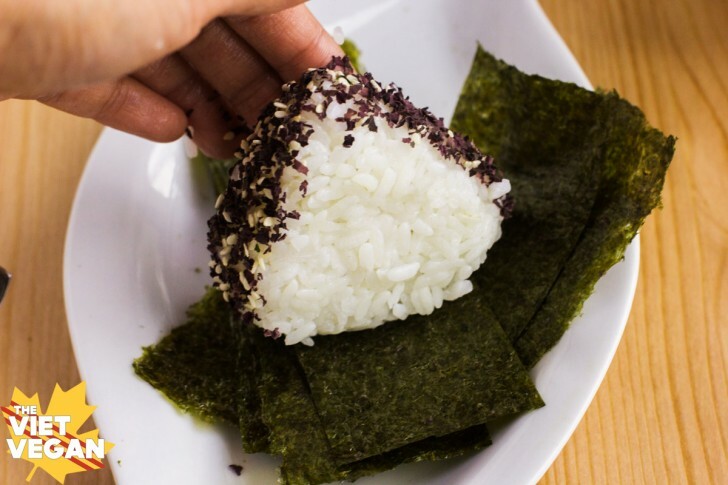 Depending on how big you want your onigiri to be, you can divide them into 10 or even 12 portions. You'll have to adjust your fillings and nori sheets accordingly. Prepare a wide, shallow bowl of the dulse flakes and sesame seeds and set aside. Cut your nori into strips and set aside. Fill a small bowl with warm water to handle the rice. Wet your hands well, and sprinkle a pinch of salt against your hands to season the rice as you grab one of the portions of rice and form into a loose, flattened ball. Use your finger to make a little indent for the filling. Add about a 1/2 tsp of miso paste into the centre, then form your rice around the indent to cover it. Make a triangle shape by holding the ball flat against one palm, and then cupped with the other hand to create the shape. Rotate, shape, flatten, and shape to get the desired shape. Feel free to rewet your hands if you find the rice sticking. Press two sides of the triangle into the dulse and toasted sesame seed mixture, then press the remaining side into the middle of a strip of nori. 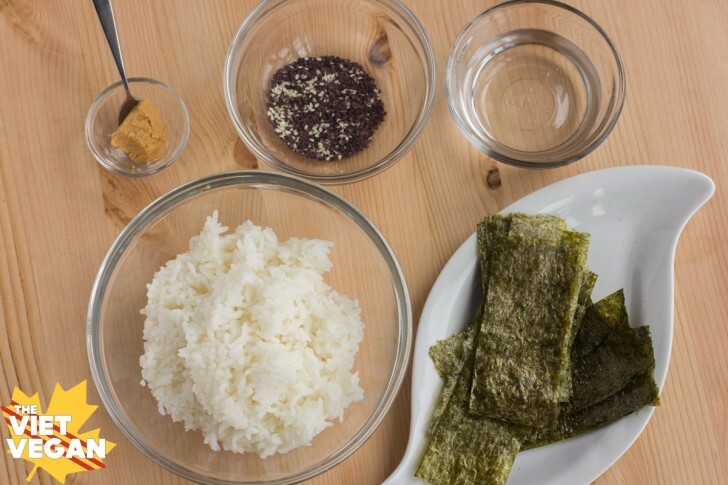 Fold the two sides of nori up on either side of the triangle, then repeat to make additional onigiri. Enjoy immediately, or wrap in plastic wrap for a simple and comforting to-go lunch. Traditional onigiri is typically made by hand, but there are plastic onigiri-triangle shapes that make the forming process much faster.